The above picture depicts Shelly drawing our house with her art teacher Annie O'Kane. Starting in February 1998, right after diagnosis, Shelly and Annie met every Satureday and had great fun together. 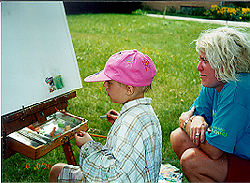 Annie taught Shelly to work with acrylic paints and oil pastels, and presented her with stimulating challenges. Shellys technique was constantly evolving, maturing and improving, and towards the end of her life, art has become a medium of self-expression as well as a fun activity. Shelly was a prolific artist, and left us more than 200 drawings and 19 paintings. At home, she was always drawing or coloring, even while watching TV. In this section we are presenting some of Shelly's artistic work. I will be working on it slowly, so please check back periodically. The images are arranged in exhibits, according to chronology or a theme. The art Shelly left behind enables us to continue the dialogue with her even after death. The exhibit Gifts From My rainbow has been shown at the Jewish Community Center of Washtenaw County and the Pierpont Commons Gallery at the University of Michigan. Read the entries in the exhibition's guestbook - they are inspiring and profound.